Overview - Godzilla is the roaring granddaddy of all monster movies. It’s also a remarkably humane and melancholy drama made in Japan at a time when the country was still reeling from nuclear attack and H-bomb testing. Its rampaging radioactive beast, the poignant embodiment of an entire population’s fears, became a beloved international icon of destruction, spawning more than twenty sequels. This first thrilling, tactile spectacle continues to be a cult phenomenon; here, we present the original, 1954 Japanese version, along with Godzilla, King of the Monsters, the 1956 American reworking starring Raymond Burr. The history of cinema is filled with tales of films being altered from their director’s original intentions by producers and studios. Orson Welles had it happen on both 'The Magnificent Ambersons' and 'Touch of Evil.' Terry Gilliam took out a full-page ad in the trades and held secret screenings with the press just to get a compromised version of 'Brazil' released by Universal. After Ishiro Honda's 'Gojira' had a brief run in the United States playing in theaters devoted to Japanese-American audiences in 1955, Joseph E. Levine got the rights to the film in 1956, and through a bit of movie magic, he turned it into 'Godzilla, King of the Monsters'. The Criterion Collection offers both films on this disc. Most people know Godzilla as a B-movie monster who went on to become an international sensation with a series of films that saw him smash models and wrestle with other rubber-suit creatures, Honda's 'Gojira' is a masterful film that brilliantly relates a cautionary tale about the horrors of the atomic bomb. As a Japanese soldier, the director witnessed the devastation of Hiroshima and recreated those haunting images in the film. The monster and its wanton destruction paralleled the atomic bomb to powerful effect. 'Gojira' opens with the inexplicable destruction of a Japanese fishing boat after a great flash of light near Odo Island. A boat sent to investigate meets a similar fate though a few survivors wash ashore. An old islander warns that the sea god Godzilla is angered, but no one takes his folk tale seriously. After a storm in the night brings massive damage, the authorities are compelled to investigate, and what they find is a massively large dinosaur-like creature, which they deduce is a result of nuclear bombs. As the creature heads to Tokyo, they strive to fight against it with conventional means, but they fail with each effort. One scientist may have the answer, but he fears what the use of his device could unleash. The story is well written, and the characters act in believable ways, though they find themselves in extraordinary situations. When 'Gojira' was bought and brought to America, the producers wanted to play up the monster angle, which had been a very successful business model at the box office during the 1950s. To make the film more accessible, the character of Steve Martin, played by Raymond Burr, was created. He is a reporter who witnesses the monster’s destruction and was inserted into some scenes through editing and tricks of staging. Scenes were cut, altered, and moved around. Director Terry Morse was given this difficult task and he pulled it off surprisingly well. The film was given the attention-grabbing title 'Godzilla, King of the Monsters'. While 'Godzilla…' succeeds as a monster movie, it is unfortunate that only 60 minutes of 'Gojira' remains in it, resulting in most of the poignancy and power of the nuclear-bomb metaphor being lost. 'Godzilla…' ends with a sense of relief after the monster is destroyed, but 'Gojira' ends on a note of trepidation as Dr. Yamane warns, "If we continue testing H-bombs, another Godzilla will one day appear." Both films accomplish their intended goals. 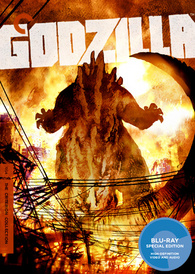 'Godzilla' (#594 in The Criterion Collection) is a 50GB Region A Blu-ray disc is housed in a cardboard slipcase that offers a wonderful surprise when opened. The discs boot up directly to the menu screen without any promotional advertisements. Included is 12-page booklet containing J. Hoberman. 's essay "Poetry After the A-Bomb". The video has been given a 1080p/AVC-MPEG-4 encoded transfer displayed at 1.37:1. The liner notes reveal the 'Gojira' transfer was created "from a 35 mm fine-grain master positive struck from the original camera negative," while the 'Godzilla…' transfer was created "from a 35 mm fine-grain master positive struck and a 16 mm dupe negative." Even with the use of the MTI's DRS system, Pixel Farm's PFClean system, and Image System's DVBR, there's only so much that can be done with the source. Scratches and wear of varying degrees are evident throughout. There's light flicker during the opening sequence when the rear projection shows a sunny sky behind the members of the first boat, and some shots are dark in the corners. Shots that are well lit, such as daytime exteriors, show good depth and fine details. Day for night shots look dim, and the dance ceremony by the islanders intended to exorcise Godzilla shows poor shadow delineation as objects get swallowed up in darkness. The textures seen on the Godzilla suit can be impressive but at times they too get lost in the darkness, such as when the creature comes onto mainland and goes through the train depot. On the other end of the spectrum, whites are blown out on occasion. 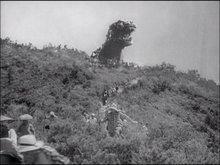 During the evacuation scene before Godzilla's arrival, one camera used a soft focus and stands out during the sequence. The 'Gojira' audio is available in Japanese LPCM 1.0 "remastered at 24-bit from the fine-grain optical track." The 'Godzilla…' audio is available in English LPCM 1.0 "remastered at 24-bit from the 35 mm fine-grain master positive's variable-density track." Both were cleaned up using Pro Tools HD and AudioCube's integrated workstation. When individual elements play, they have great clarity on the soundtrack, but when mixed, they diminish each other. The scenes when Akira Ifukube's memorable score plays under the people screaming in terror as Godzilla's iconic roar rings out unfortunately just sound like blaring noise. Even the use of two elements don't blend well together as the roar can be heard drowning out the score during the opening credits. The tank cannons don't have any heft behind them, but softer sounds, like the crackle of fire, can be clearly heard. Considered a bonus, but to me Criterion has released a double feature. David Kalat, author of A Critical History and Filmography of Toho's Godzilla Series, is an obvious fan of the films as his delight shines through. He offers good insight and anecdotes about both versions. Five members of the cast and crew are interviewed in the feature. Actor Akira Takarada (13 min), who played Ogata, talks about taking on his biggest role. 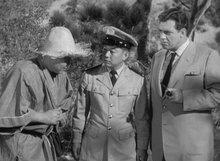 Actor Haruo Nakajima (10 min) is the man in the suit and gets some well-deserved face time. Great behind-the-scenes pictures accompany his segment, as he talks about what he went through wearing the 220 lbs. suit and having no AC in studio. Model builder Yoshio Irie and and Godzilla suit coconstructor Eizo Kaimai (30 min) sit together to talk about the effects work done on the film. Recorded in 2000, composer Akira Ifukube (51 min) talks about his life, career, and approaches to his work. Effects director Koichi Kawakita and SFX cameraman Motoyoshi Tomioka show unused test footage from the composite images used in test shots. Some have been augmented to create movement. The film critic discusses the creation of 'Gojira' and its relation to Japanese culture, an interesting perspective to learn. Gregory M. Pflugfelder of Columbia University narrates this photo essay about the unfortunate plight of the Daigo fukuryu maru (Lucky Dragon No. 5), which was an inspiration for the story. Both 'Gojira' (3 min) and 'Godzilla…' (2 min) are available. Even with the A/V issues mentioned above, Criterion has done a great job with this release, treating it no differently than other landmarks in cinema history. Though the following films in the franchise carry a much different tone and appeal, 'Gojira' is the work of a serious filmmaker dealing with important themes. And if you enjoy seeing models smashed, it's good for that too. Highly recommended.